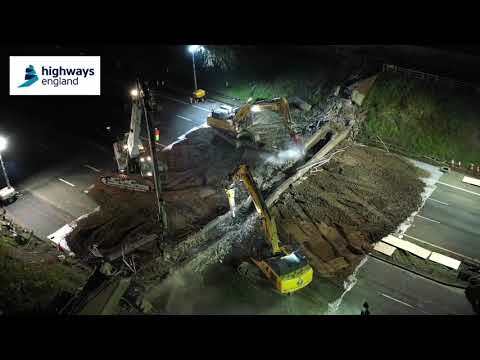 Demolition contractor Squibb brought down a 200ft-long motorway bridge spanning the width of the M6 during a night-time closure on the weekend of 23rd/24th March 2019. The M6 was shut in both directions, between junctions 13 and 14 at Stafford, to carry out the complex demolition of the Burton Bank footbridge, which weighed 140 tonnes. This video was filmed by Kier, main contractor for Highways England. Video uploaded on 29/03/2019 12:00am.